These luscious new pencil sets put a rainbow at your fingertips. 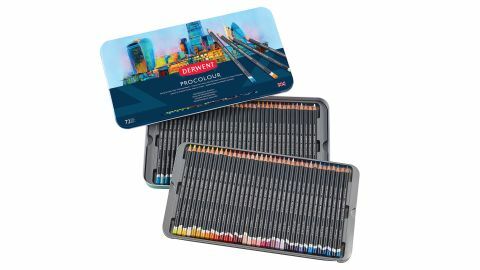 These luscious new sets of Procolour pencils from Derwent feel substantial and draw beautifully. Hailing from the heart of the Lake District, Derwent is a quintessential UK brand, and produces some of the best pencils around for artists. Derwent has been crafting pencils since 1832, so should know a thing or two about what makes a good one. Always drawn to perfection, its previous coloured pencil ranges have been highly acclaimed among pencil enthusiasts worldwide, made famous by the company's innovative approach to product ranges, pigment-packed leads and top-quality wooden shafts. Following Derwent’s popular Artists, Coloursoft and Studio ranges comes the brand-spanking new Procolour range for 2017. Available in an array of tin quantities, there’s a set to fit most budgets and any of these would make a handsome addition to your studio set-up or sketching kit. The 72-pencil set should definitely be on the studio wish-list, though. This comprehensive set is presented in two vac-form trays tiered within a sturdy metal tin, perfect protection for carting about across dale or on a more urban trek. The tin itself is adorned with the new Derwent branding of the dark-blue toned Union flag design, which makes it instantly recognisable and looks pretty cool, too. The product design makes for a pencil that feels substantial, with each one having a sturdy circular shaft that slots well between the fingers. They look the part too, sporting a sleek matte-grey body embossed with silver type declaring the country of origin, brand, inventive moniker, a handy reference number (for when you drop the lot and need to put them back in order) and finally a lovely gloopy wedge of colour for quick and easy identification. When it comes to pencils the proof is always in the drawing and the new Derwent Procolour don’t disappoint. Due to its substantial design, the pencil sits comfortably in the hand and its sturdiness gives you the confidence to wield it with unabashed fervour. The lead also feels well balanced on paper. Not too waxy (you can get softer pencils from Derwent if that’s what you’re after) and not too brittle. The high pigment levels are evident from just the lightest of touches, and applying increments of greater pressure gives a wonderful gradation of pure colour without pushing into the surface of your paper or support. The pencils obviously blend wonderfully, but the colours might be best served using a build-up of cross-hatching that allows the purity of each colour to sing out. Sharpening is also a doddle with the wooden shafts and leads reacting effortlessly to a quality metal sharpener or scalpel. There’s a special relationship we artists have with what goes on between the tip of a pencil and our minds’ eye – it’s a subtle balance of trust and experience. If you’re new to the world of pencils, you won’t go far wrong with Derwent. And if your allegiances lie elsewhere, it might be time to gift yourself the chance to try something new. This article originally appeared in Paint and Draw issue 9. Subscribe today.